Tomatoes always remind me of summer time and sewing! I’m sure you can remember your grandmother’s well-worn tomato pincushions. 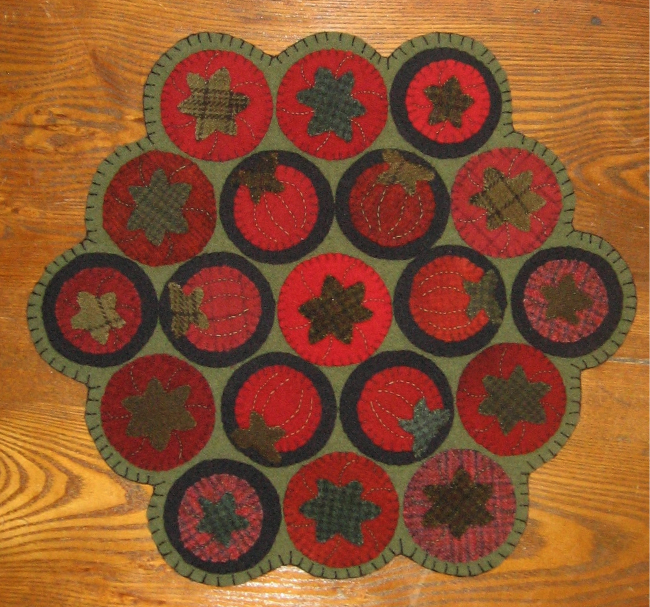 My friend Liberty Rose loves tomatoes pin cushions so much, she made this delightful pattern for a tomato penny rug. I started this project last summer and it is listed as one of the UFOs to finish for this year. It can now be crossed off the list. Right now it is sitting on top of the antique spool chest in my sewing room! This is the fifth penny rug I’ve made in the past few years. These little projects are fun to make because you can easily carry a few pennies around in your purse and stitch on them when you can. Pennies are also fun because there is so much you can do with this as far as embellishments and embroidery! I have a few ideas for my own penny rug designs based on Liberty Rose’s basic template (with her permission of course). I plan to get the patterns finished up by the end of the year as part of the pattern line I am creating. Also, I have decided on the date for the quilter’s yard sale – July 23rd from 8am – 12pm. If you want to do some virtual shopping, just let me know. For those of you in the area, stop by (email me offline for my address). This entry was posted in Applique, Embroidery, Wool. Bookmark the permalink. Very nice pattern! I like how you moved all the green bits around the tomatoes. Very yummy, well done! Thanks Sandi! What projects are you working on now? It looks great and this is from a person who doesn’t care for tomatoes in any form!! Well done!!! Thanks Mrs. B! You don’t even like spaghetti sauce or ketchup?